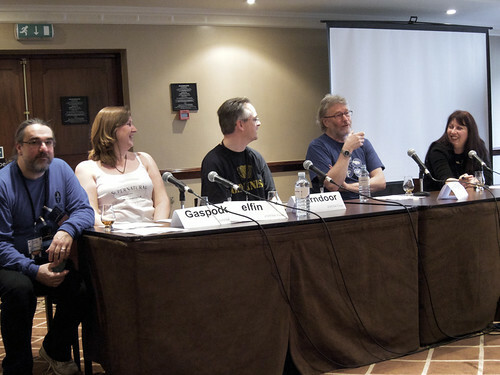 Being a science fiction fan I spent the long easter weekend just gone hidden away in hotel by Heathrow airport attending Eastercon, the yearly british sci-fi convention. While the con committee managed to rustle up a bar full of London Pride and Old Rosie (even if the cider did its traditional thing and disappeared a lot faster than the bar staff expected) the other bars were fairly lacking in interesting booze. 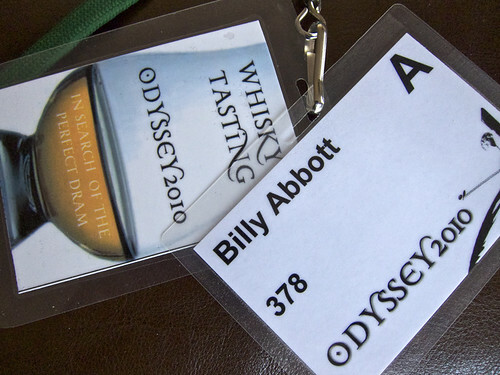 I continued my habit of drinking through the most interesting whiskies that they had (knocking back some Glenkinchie, Knockando and Caol Ila) but one program item above all caught my eye – a whisky tasting with Iain Banks. Mr Banks is one of my favourite authors, not only for his excellent regular fiction and SF but also for his other book – Raw Spirit. It may claim to be a book about whisky, but the main things I remember are a page of waxing lyrical about Chateau Musar (which I now try and keep at least one bottle of in the house at all times) and many more passages about how much fun it is to drive around the great wee roads of Scotland in a Land Rover. However, the book is one of the things that kicked me into trying to explore non-beery boozes and also to write about it, so obtaining a spot on the whisky tasting became a mission. I foolishly turned up several hours before sign up to make sure I got one of the 15 spots only to find that a) noone was queuing at 8am and b) noone was awake at 8am. However, a queue did appear at about 9am and as number 4 in line I got on the list. We convened later that day for the tasting, led by a panel including Iain Banks and Liz Williams, two of the convention’s guests of honour, with an original plan of going through six whiskies: a lowland, a highland (although one on the edge of speyside), two speysides and a pair of Islays. First up was Auchentoshan 12 year old, our easy drinking lowland to lull the non-whisky drinkers into a false sense of security. I’ve not tried the regular Auchentoshan before (this having replaced the previous standard 10 year old expression), although I did work my way quite happily through a bottle of their Three Wood a few years back. This is a unique distillery in that it distills its spirit three times, rather than the standard twice of the other distilleries in Scotland. On the nose the whisky was quite strong, with a touch of vanilla and quite a slug of alcoholically themed scents – pear drops, lighter fluid and a hint of acetone, although I suspect that part of that was from the use of plastic cups and my already setting in con tiredness. To taste it was not as light as I expected, with a chunk of wood and tannin softening into vanilla and a touch of honey. A drop of water opened up the sweetness into a more honeyed caramel and revealed a touch of smoke, fruit stones and linseed oil as it developed in the glass. Definitely one to let sit with a drop of water in, it mellowed into rather an interesting dram over a few minutes. Iain Banks is quite well known for his ability to spin a yarn in person as well as on paper and in between whiskies there was a touch of discussion and story telling, even if it did inevitably splinter into 10 conversations as the booze started to settle in. It seems that I was not the only one to notice a hint of the petrolhead in Raw Spirit, but Banks has started to tone down his car collection due to a touch of green guilt. The Land Rover and fast cars seem to have disappeared to be replaced by first a hybrid and now a diesel, a tale accompanied by a slightly sad tone to his voice. Next we moved to the highlands for the Dalwhinnie 15 year old. One of my fall back malts this is one that I know well, having visited the distillery a few times and had numerous bottles in my cupboard as a drink I know I like. On the nose there’s a touch of smoke and a sweetness that turns into fruit salad chews in the mouth. It also has a peppery prickle on the tongue and a bit of toffee. Water evens out the smoke a touch, letting a bit of the fruitiness come out. Hiding at the back of the audience, behind the lucky people who got the drinking passes, was a lady who works in the perfume industry and as a discussion of flavours and scents flourished she chipped in with some interesting thoughts from a different but very similar industry. As we started describing the flavours of the whiskies, and comparing them to the traditionally flowery tasting notes, the inevitable contradictions started to appear. There are many reasons for this, with two main points coming up. Firstly the physical limitations of smell, from genetic heritage governing sensitivity to certain chemical compounds, to just the fact that over time (and with age) the senses start to dim, leading to them being less overpowered when you experience a strong flavour such as whisky. Secondly the role that experience plays in both forming sense memories and retrieving them, leading to flavours that may not perfectly line-up but mean something to the individual. Next on the list was our next speyside – Glenlivet French Oak. This, like Macallan, is one of those whiskies that I kept meaning to get round to again – a big name that I assume I know the taste of, but don’t actually remember. The French Oak is yet another whisky that uses a bit of new wood in its production – a proportion of the blend of malts has been matured in new Limousin oak casks. On the nose it had vanilla and red fruit but became a bit more complicated in the mouth, with a malty sweetness, creaminess and a hint of smoke. A touch of water turned up the heat and added some more wood to the flavour but turned down both creaminess and sweetness. A much more interesting dram than I expected, especially with the creamy mouth feel that the oak brought, but one to drink at bottle strength. Next was the first of our cask strength whiskies, bottled by the Scotch Malt Whisky Society – 24.106: Discordant Staves. It’s a 12 year old Macallan which I assume was matured in one of their regular sherry casks. On the nose it was fruitcakey with a thick caramel sweetness, but on tasting a lot of the cake fell away to give a sweet, slightly oily dram with hints of raisins and a touch of rubberiness running through the middle. A rather different flavour to the other Macallan’s I’ve tried recently and one that has pushed them towards the top of my ‘taste these when they arrive at the SMWS’ list. Our discussions about flavours and experiences led to how we decide on what a ‘good’ whisky is. In the end a large part of that seems to come down to the associations that the whisky had. Liz Williams had a fondness for Glenfiddich, as it’s what her dad drinks, other people had drinks that they’d had a weddings or parties. 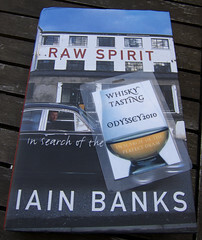 When ‘researching’ (the quotes were explained as being implicit in all mentions of the word) Raw Spirit, Iain Banks actually did very little drinking at the distilleries – as the main driver he ended up buying a bottle from every distillery he visited for later sampling at home. However, he mentioned that one of his favourite whiskies was an Ardbeg, one that he tried at the distillery. The experience of drinking a one of a kind barrel, since sold to someone else, standing beside the distillery as the sun sets over the sea is an experience I can see sticking with you, especially if it’s a good dram. Suitably, our next whisky was Ardbeg 10 year old. Ardbeg’s a bit on the up at the moment, with a lot of their limited production being snapped up quite quickly. I’ve not tried it since I met up with some friends a couple of years back to drink our way through the rather complete range that Adam had ‘accidentally’ bought while leafing through the Ardbeg web store. The 10 year old is the standard expression and it shows the distillery’s nature quite well. On the nose it has a strong peatiness, moving into a cattle feed and mulchy sweetness. On the tongue the smoky peat taste continues to dominate, with woody sweetness, a thick rubberiness and a slightly buttery taste combining to make a rather nice whisky. It’s not one for the fainthearted, with the TCP-like taste of the very peaty Islay whiskies shining through, but if you like that sort of thing it won’t disappoint. By this time conversation was getting a bit confused – it’s quite surprising how many people can get a decent sized shot out of a bottle of whisky… We quickly moved on to our final dram in the tasting, another SMWS cask strength bottling, this time of a Laphroaig – 29.80: Wedding Cake in a Coal Sack. 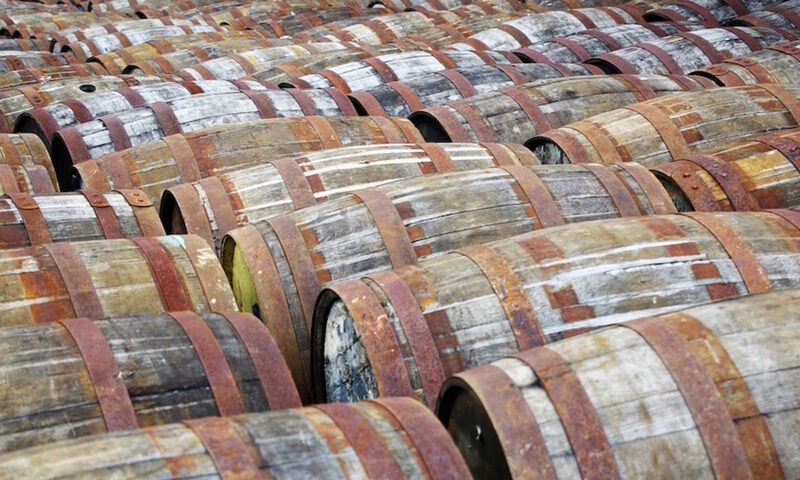 Laphroaig’s reputation preceded it, which made this dram a bit of a sheep in wolf’s clothing – a stealth whisky. Rather than the regular TCP, sea spray and peat that you’d expect, I got hint of burnt matches on the nose, along with a rich fruity sweetness. To taste it continued the nose with ash, citrus and dried fruit all coming through. A drop of water removed little, adding a taste of coal and a slightly socky tint. A very interesting whisky, not at all what we expected and a good one to finish the tasting. Unfortunately, or fortunately depending on your state of inebriation, a few of us had brought along a few samples of our own. 1/2r Cruttenden brought along a bottle of the St George’s English whisky, which very quickly was accepted into the running order as a final drink of the session. This is part of the first release, at 3 years old, with the distillery having released ‘Chapter X’ bottlings every six months over the maturation of the spirit. It’s only a limited release as they want to mature it a bit longer, a decision I thoroughly agree with. The whisky is obviously very young, with only a little of the wood’s flavour penetrating the spirit, leaving it with a definite hint of aquavit and caraway seed. However, it is a very smooth whisky with an incredibly thick and creamy mouth feel that makes me want to get my name on the waiting list for new bottles. There is also a peated version coming out in the summer which seems to be preferred by many, so I may have to look into obtaining a bottle. For scientific purposes, of course. On top of that I tried a drop of my own Yamazaki Sherry Cask, still as good as ever, and a big sip of some 18 year old Bladnoch that was more fully flavoured than any lowland I’ve tried in a long time – another to move back up the tasting list.